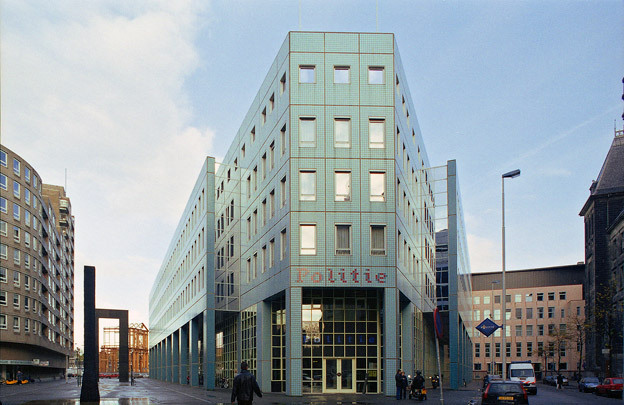 The original police headquarters on Haagseveer have been extended with a V-shaped volume that pulls together the former amorphous situation into a lucid network of streets and squares. Its new main entrance in the tip of the V points towards the Coolsingel boulevard. The side elevations have been built across the pavements to gain extra space; the arcade this has created stresses the public nature of the functions housed at ground level. The brick frontage of the existing building has been insulated with bright red rendering and the old roof structure replaced with a floating roof deck of eccentric design.